Background and Objective: Demand is increasing for esthetic restorations in pediatric dentistry. When full coverage is indicated, one option is to use esthetic stainless steel crowns (SSCs). However, this type of crown is prone to fracture. The purpose of this study was to evaluate the fracture resistance of 3 types of esthetic SSCs. Materials and Methods: Esthetic SSCs for first primary mandibular molars were cemented to idealized epoxy dies with glass ionomer cement. The die–crown units were fractured on a universal testing machine. The force was delivered by a stainless steel ball fixture, set in a uniaxial lever to replicate a cusp contact, with a crosshead speed of 1 mm/min. The differences among the 3 types of crown, in terms of force required to fracture, were compared statistically by 1-way analysis of variance. Pairwise comparisons were performed with Fisher's protected least significant difference test, at an overall significance level of 5%. Results: The force required to fracture, expressed as average ± standard error, did not differ significantly among the 3 brands of esthetic SSCs: 1730 N ± 50 N, 1826 N ± 62 N and 1671 N ± 68 N, respectively (p = 0.19), well below the maximum bite force of pediatric patients determined in a previous study. Conclusion: Esthetic SSCs should be able to resist occlusal forces over short clinical periods. However, long-term occlusal loading and fatigue failures should be taken into account when evaluating the success of this type of crown. The use of esthetic restorations has become an important aspect of pediatric dentistry.1 Patients of all ages have increased, sometimes unrealistic, expectations of dentists' ability to replicate, or even enhance, the original appearance of their decayed dentition,2 and parents often apply their own increased expectations when their children need dental care. Ideally, a child's dentition should be maintained free of caries, but over the past decade, there has been an increase in the prevalence of caries among children 2–11 years of age.3 In cases where decay is present, parents would like their children's restorations to be esthetically pleasing.4 For children who present with large, multisurface carious lesions of the primary teeth, the American Academy of Pediatric Dentistry advocates use of a full-coverage restoration. Historically, such restorations have been in the form of stainless steel crowns (SSCs).5 However, this proven restoration often fails to meet the esthetic demands of patients' parents.6 The esthetic SSC, an SSC veneered with a tooth-coloured material (either a resin composite or porcelain) that covers most of the metal coping, allows the dentist to address parents' esthetic wishes while effectively treating the decay. Esthetic SSCs are essentially SSCs with a composite or porcelain coating that is chemically or mechanically attached to a metal coping. The combination of the 2 materials allows for a trade-off between their respective strengths and weaknesses. Stainless steel is strong, resilient and malleable. The thickness of the metal in SSCs is 0.2 mm, and no additional thickness is required to achieve clinical acceptability. One study9 showed that after 2 years of clinical use, the rate of perforations or dents of SSCs was only 12%. Furthermore, stainless steel does not fracture and can be modified by crimping to ensure proper adaptation to the prepared tooth structure. However, its metallic appearance can be a deterrent to both patients and practitioners. Composite or porcelain restorations can capture various esthetic tooth shades and can be used to hide the metallic appearance of the base structure. These esthetic materials must be applied at a thickness of 1.5 to 2 mm to withstand the patient's occlusal forces. When the 2 materials are combined into a crown form, the stainless steel acts as a thin but strong foundation for the composite or porcelain, which gives the restoration a more tooth-like appearance. Esthetic SSCs have several shortcomings relative to SSC restorations. They require a greater reduction of tooth structure during preparation than is the case for traditional SSCs.10 In addition, esthetic SSCs cannot always be crimped11 to fit to the prepared tooth, and repair of fractured coatings may entail complete replacement.12 There is also a greater need for occlusal reduction with esthetic SSCs, which can increase the risk of exposing vital pulp. Although the prognosis for vital pulpotomy is good,13 the procedure increases chair time and cost. The shape of an esthetic SSC cannot be altered, because this would change the rigid metal coping structure beneath the somewhat brittle composite, leading to the possibility of future fracture.14 Fracture of an esthetic SSC can lead to loss of space in the developing pediatric dentition, as well as increased retention of plaque.12 In this situation, the tooth may remain free of caries, but the esthetic purpose for using this type of restoration will not have been achieved. In one study, 54% of esthetic SSCs had adverse esthetic outcomes, such as chipping, discoloration or loss of coating, after 2 years.14 In another study, chipping or complete loss of the esthetic coating had occurred in all posterior crowns that were tested at 4 years.12 A previous publication described a method of restoring fractured esthetic SSCs,15 but sometimes the only way to re-establish the esthetic appearance is by replacing the crown. Therefore, although esthetic SSCs may represent an esthetic improvement over traditional SSCs, the increased potential for pulpal exposure, the difficulty of achieving a clinically acceptable fit and the tendency of the esthetic coating to fracture are potential shortcomings. The first primary molars are the primary teeth that most commonly receive full-coverage restorations.6 Of the teeth in the posterior area in the mouth, parents are most concerned with the esthetics of mandibular first primary molars.16 Various studies have considered the bite force of both pediatric and adolescent patients,17,18 but in most studies, the sensor was placed in the posterior-most tooth area. Braun and colleagues19 measured maximum bite force in the area of the first primary molar and the first permanent premolar, as this region could be used for testing in younger children, and measurement in this area was comfortable for participants. Linear regression generated values of maximum bite force ranging from 78 N for 6-year-olds to 106 N for 10-year-olds. The study setting and age group for that earlier study were similar to those of the current study, which was designed to measure the force required to fracture primary molars in the pediatric setting, so the data published by Braun and colleagues19 were suitable as control values for the current study. The purpose of the study reported here was to determine the maximum occlusal load to failure of the esthetic component of 3 types of esthetic SSCs and to compare this load with the posterior occlusal loads in the primary first molar area reported by Braun and colleagues (i.e., 78–106 N for patients 6–10 years of age). The force required to fracture the esthetic component of 3 types of esthetic SSCs for primary mandibular first molars was measured. These data were compared with the range of posterior occlusal loads in the first premolar region determined in vivo in a previous study of children 6 to 10 years of age. Testing was conducted on esthetic SSCs manufactured by 3 companies (EC crowns, Dental Innovators, Austin, TX; Kinder Krowns, St. Louis Park, MN; NuSmile Primary Crowns, Houston, TX). Thirty specimens of each type were tested. The crowns were all primary mandibular first molars. Two companies (Kinder Krowns and NuSmile Primary Crowns) were able to supply identical specimens of the same crown, a size 4 left mandibular first molar. The 30 samples supplied by the third company (Dental Innovators) consisted of 13 size 4 left mandibular first molars, 12 size 4 right mandibular molars and 5 size 5 left mandibular molars. Dental Innovators and Kinder Krowns both used mechanical and chemical means of retention for the union between the esthetic coating and the underlying base. The crowns produced by NuSmile Primary Crowns had a chemical union without any visible mechanical adhesion. A negative replica of each company's crown was fabricated with polyvinylsiloxane impression material (Examix NDS, GC Corporation, Tokyo, Japan) and allowed to set for 24 hours. This impression was then used to fabricate an idealized epoxy die for each crown, and each die was also allowed to set for 24 hours (Fig. 1). The crowns and dies were tried on to ensure a passive fit. Any visible undercuts in the dies were removed with a composite finishing bur. The esthetic SSCs were cemented onto the epoxy dies according to each manufacturer's instructions with resin-modified glass ionomer cement (G-Cem, GC Corporation). The die–crown units were then allowed to set for 24 hours (Fig. 2). Each die–crown unit was placed into a custom-made holder on a universal mechanical testing machine (MTS, Eden Prairie, MN), and loading was increased until the crown fractured (Fig. 3). The force was delivered through a stainless steel ball fixture, set in a uniaxial lever intended to replicate a cusp contact. Testing was performed in a single cycle, with the speed of the crosshead maintained at 1 mm/min, until the esthetic component fractured. Figure 1: Idealized epoxy die of a NuSmile crown fabricated from a polyvinylsiloxane impression. Figure 2: Esthetic stainless steel crowns cemented to idealized epoxy dies. Left to right: EC crown (Dental Innovations), crown manufactured by Kinder Krowns and crown manufactured by NuSmile Primary Crowns. 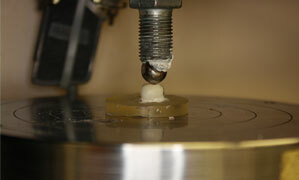 Figure 3: Die and crown positioned in the universal testing device for fracture with a stainless steel ball bearing. The confidence intervals and ranges of the force required to fracture, for the 3 types of crown, were well above the control value for occlusal force (i.e., the load generated by 6- to 10-year-old children, as documented by Braun and colleagues19) (Table 1). The force required to fracture did not differ significantly among the crowns supplied by the 3 manufacturers (p = 0.19). This study was undertaken to determine the force required to fracture 3 types of esthetic SSCs in the first primary molar area and to statistically compare these values with the average occlusal load generated by 6- to 10-year-old patients, as reported previously. Esthetic SSCs represent an attempt to meet parents' desires for an esthetic restoration while addressing dentists' desires for a durable restoration that can withstand the occlusal forces of mastication. Premature loss of the esthetic covering of an SSC may result in dissatisfaction on the part of patients and their parents and frustration on the part of the dental provider. In this study, all crowns tested through a single cycle were able to withstand occlusal forces equivalent to the previously documented bite force of young children in the first mandibular primary molar area. If esthetic SSCs are exposed to uniaxial force loads equivalent to those generated by children 6 to 10 years old, the esthetic coating should not fracture. However, the 4-year in vivo survival of this coating was less than desirable.12 This discrepancy between in vitro and in vivo results may be related to several factors. First, occlusal function is not uniaxial. Also, in clinical practice, the crown preparation is rarely a perfect match for the selected preformed crown. In addition, the chemical characteristics and the temperature of the oral environment cannot be strictly controlled. As such, it is likely that fractures of the esthetic coating observed in clinical situations could be attributable to certain variables that are typically well controlled in experimental settings, including the multiaxial (rather than uniaxial) application of force, improper placement of crowns (with consequent development of stress or mechanical retention), cyclical application of occlusal forces by the patient, and variations in temperature or chemical characteristics within the oral environment. In addition, flaws in the brittle esthetic coating may enlarge with the application of occlusal loads, eventually causing fracture failures once they reach a critical size. Any of these factors could lead to the discrepancy between the results of this study and the clinical failures that Ram and colleagues12 observed in their in vivo study. The minimum and maximum values of force required to fracture the esthetic SSCs differed substantially among the 3 types of crowns. This disparity may be attributable to the mode of bonding between core and surface material in each crown and the ways in which the crowns failed. Adhesion is defined as the interaction at the interface between 2 materials,20 whereas cohesion is the interaction between molecules within one material.20 Because of differences in manufacturing processes and resulting differences in the use of mechanical and chemical adhesion for each type of crown, the esthetic component of the crowns in this study suffered different types of failure. In particular, 5 of the NuSmile crowns suffered failure of adhesion (Fig. 4), whereas the remaining samples suffered failure of cohesion. All of the Kinder Krown crowns had cohesion failure, with the esthetic material chipping off the coating (Fig. 5). The EC crowns also suffered cohesion failure, with the esthetic coating cracking, rather than fracturing, off the metal coping. The potential for variation in the manufacturing and design principles of the crowns could have resulted in the large standard deviation for force required to fracture the esthetic coating that is reported in this study (Table 1). Figure 4: NuSmile esthetic stainless steel crown showing failure of adhesion of the esthetic component. Figure 5: Kinder Krown esthetic stainless steel crown showing failure of cohesion of the esthetic component. Evidence-based decisions are an important tool in dentistry. However, there is little evidence to support the choice of esthetic SSCs over other established restoration options. These crowns entail additional preparation time, because more tooth structure must be removed. In turn, the greater loss of tooth structure increases the risk of noncarious exposure of the pulp. A previous in vivo study indicated poor 4-year survival of the esthetic component of these SSCs.12 However, esthetic SSCs do offer an esthetically pleasing solution to severe breakdown of a primary molar when composite resin or glass ionomer is contraindicated because insufficient tooth structure remains after removal of the caries. The option exists to place a laboratory-fabricated or milled crown, but because of the greater time required for scanning or fabrication of the impression, as well as the enormous increase in cost, few parents would make this choice. Parents' esthetic demands for their children's dental restorations continue to increase. Many companies now offer esthetic products that can withstand the application of forces that children would be able to produce. These esthetic SSCs offer a solution when full coverage of the tooth is required. Nonetheless, clinical studies have reported fracture failures of the crowns, and evidence supporting the widespread use of esthetic SSCs therefore remains limited. Further studies and refinements are necessary before this type of crown becomes universally accepted. In this study, the 3 brands of esthetic SSCs tested had similar fracture resistance to the application of uniaxial force. Further study is needed to evaluate their performance under cyclical and multiaxial force loads and thus to determine their potential for clinical success. Dr. Beattie is in private practice in London, Ontario. He is an adjunct professor in the department of dentistry, University of Western Ontario, London, Ontario. Dr. Taskonak is an associate professor, Nova Southeastern University College of Dental Medicine, Fort Lauderdale, Florida. Dr. Jones is a professor and chair of pediatric dentistry, Riley Hospital for Children, Indianapolis, Indiana. Dr. Chin is an associate professor, Indiana University School of Dentistry, Indianapolis, Indiana. Dr. Sanders is a professor and director of the graduate pediatric dentistry program, Riley Hospital for Children, Indianapolis, Indiana. Dr. Tomlin is an assistant professor, Indiana University School of Medicine, Indianapolis, Indiana. Dr. Weddell is an associate professor in pediatric dentistry, Riley Hospital for Children, Indianapolis, Indiana. Acknowledgements: Support for this project was provided by the Indiana University Pediatric Dentistry Alumni Association and the Indiana University School of Dentistry Graduate Research Committee. The study was completed in partial fulfillment of the requirements for a Master of Science in Dentistry earned by Dr. Beattie from Indiana University. The authors thank Mr. George Eckert, Ms. Meoghan MacPherson and Dr. Jeffrey Platt for their help in the preparation of the manuscript. Zimmerman JA, Feigal RJ, Till MJ, Hodges JS. Parental attitudes on restorative materials as factors influencing current use in pediatric dentistry. Pediatr Dent. 2009;31(1):63-70. Morley J. The role of cosmetic dentistry in restoring a youthful appearance. J Am Dent Assoc. 1999;130(8):1166-72. Dye BA, Tan S, Smith V, Lewis BG, Barker LK, Thornton-Evans G, et al. Trends in oral health status: United States, 1988-1994 and 1999-2004. Vital Health Stat 11. 2007 Apr(248):1-92. Espelid I, Cairns J, Askildsen JE, Qvist V, Gaarden T, Tveit AB. Preferences over dental restorative materials among young patients and dental professionals. Eur J Oral Sci. 2006;114(1):15-21. American Academy of Pediatric Dentistry reference manual 2007-2008. Pediatr Dent. 2007-2008;29(7 Suppl):1-271. Seale NS. The use of stainless steel crowns. Pediatr Dent. 2002;24(5):501-5. Messer LB, Levering NJ. The durability of primary molar restorations: II. Observations and predictions of success of stainless steel crowns. Pediatr Dent. 1988;10(2):81-5. Roberts JF, Sherriff M. The fate and survival of amalgam and preformed crown molar restorations placed in a specialist paediatric dental practice. Br Dent J. 1990;169(8):237-44. Yilmaz Y, Simsek S, Dalmis A, Gurbuz T, Kocogullari ME. Evaluation of stainless steel crowns cemented with glass-ionomer and resin-modified glass-ionomer luting cements. Am J Dent. 2006;19(2):106-10. Fuks AB, Ram D, Eidelman E. Clinical performance of esthetic posterior crowns in primary molars: a pilot study. Pediatr Dent. 1999;21(7):445-8. Waggoner WF, Cohen H. Failure strength of four veneered primary stainless steel crowns. Pediatr Dent. 1995;17(1):36-40. Ram D, Fuks AB, Eidelman E. Long-term clinical performance of esthetic primary molar crowns. Pediatr Dent. 2003;25(6):582-4. Dean JA, Mack RB, Fulkerson BT, Sanders BJ. Comparison of electrosurgical and formocresol pulpotomy procedures in children. Int J Paediatr Dent. 2002;12(3):177-82. Roberts C, Lee JY, Wright JT. Clinical evaluation of and parental satisfaction with resin-faced stainless steel crowns. Pediatr Dent. 2001;23(1):28-31. Yilmaz Y, Gurbuz T, Eyuboglu O, Belduz N. The repair of preveneered posterior stainless steel crowns. Pediatr Dent. 2008;30(5):429-35. Randall RC. Preformed metal crowns for primary and permanent molar teeth: review of the literature. Pediatr Dent. 2002;24(5):489-500. Gaviao MB, Raymundo VG, Rentes AM. Masticatory performance and bite force in children with primary dentition. Braz Oral Res. 2007;21(2):146-52. Sonnesen L, Bakke M. Molar bite force in relation to occlusion, craniofacial dimensions, and head posture in pre-orthodontic children. Eur J Orthod. 2005;27(1):58-63. Braun S, Hnat WP, Freudenthaler JW, Marcotte MR, Honigle K, Johnson BE. A study of maximum bite force during growth and development. Angle Orthod. 1996;66(4):261-4. Marshall SJ, Bayne SC, Baier R, Tomsia AP, Marshall GW. A review of adhesion science. Dent Mater. 2010;26(2):e11-6. Shirakura A, Lee H, Geminiani A, Ercoli C, Feng C. The influence of veneering porcelain thickness of all-ceramic and metal ceramic crowns on failure resistance after cyclic loading. J Prosthet Dent. 2009;101(2):119-27. Zarone F, Sorrentino R, Traini T, Di lorio D, Caputi S. Fracture resistance of implant-supported screw- versus cement-retained porcelain fused to metal single crowns: SEM fractographic analysis. Dent Mater. 2007;23(3):296-301. Braun S, Bantleon HP, Hnat WP, Freudenthaler JW, Marcotte MR, Johnson BE. A study of bite force, part 1: Relationship to various physical characteristics. Angle Orthod. 1995;65(5):367-72. Epub 2006 Mar 24.